I’m curled up on a soft bed in a wooden hut, and through a fug of jetlag and a soundtrack of bleating goats and insistent birdsong, I’m trying to make sense of the view. I’m in the first few minutes of a two-week writing residency at The Wellstone Center in the Redwoods, and I can’t quite believe I’m here. “Here” is Soquel, California. 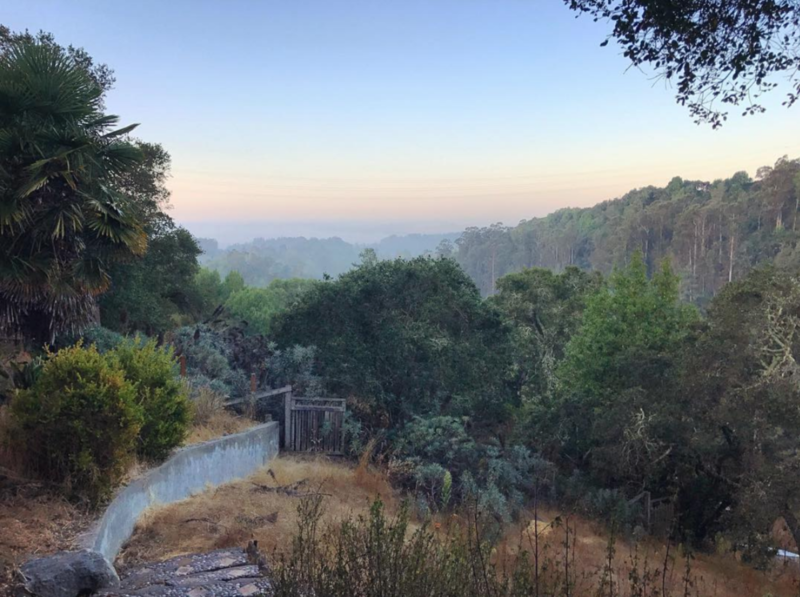 Around 15 minutes from the centre of Santa Cruz, the residence sits atop a hill overlooking a valley of Californian oak, dotted with shallow-rooted eucalyptus trees poking out through a blanket of perfect white fog. The sun is beaming down into the strip of ocean on the horizon. The air is crisp and impossibly clean. This will be my home for two long, strange, incredible weeks. Let me tell you about the place. The view of the main house from my little cabin. That's where I go to find electricity, running water and internet - as well as other humans. 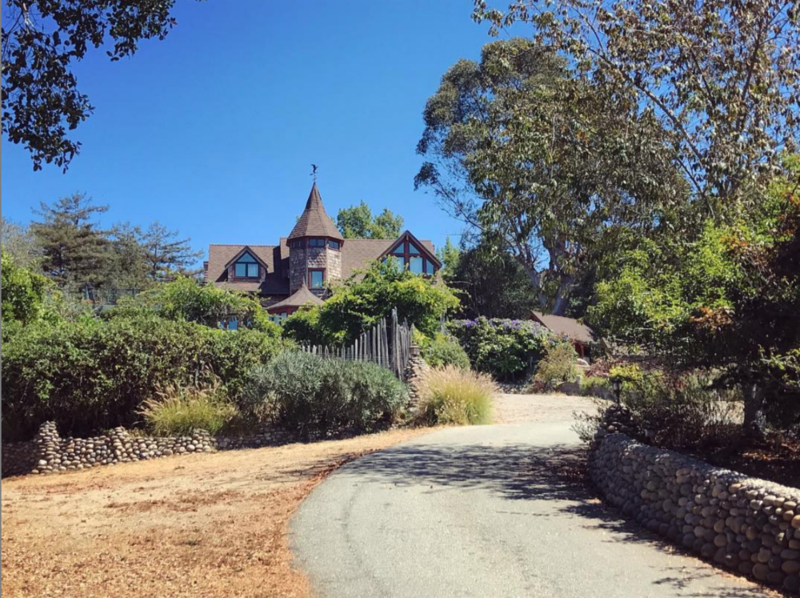 Outside there's a stunning pool and hot tub overlooking herb and vegetable gardens, and winding paths gorgeously littered with fallen pumpkins and squash. I stayed in the Library House, a wooden cabin a little way from the main house. It has no water or electricity, just shelves of books with thoughtful and colourful notes attached - the poetry section, the travel section, American classics, an entire shelf of Hemingway. The trees provide some shade from the sun streaming in through the windows in the morning, and the birds act as an alarm clock gentle enough to sleep through. The Library House has a wraparound deck, a lovely place to sit and drink coffee, write or do yoga. It looks particulalrly beautiful at night by candlelight. Just ignore the spiders. They're numerous, but they don't want any trouble. The other writers stayed in the Pool House (pictured in the video at the end of this post), a little cottage with its own kitchen and bathroom, and there are also some lovely rooms inside the house. Everyone has to work an hour a day while on a residency, and my job was to milk the goats. Let me repeat that: I got to MILK the FREAKIN' GOATS. Their names were Doris and Butterfingers, I totally adored them both, and between them they produce a bucket of milk a day. My expectations of my goat-milking abilities were low; it was suggested I may take the full two weeks to be able to do it without supervision. But I had an excellent teacher in Dave, the nomadic intern from Chicago who was helping out at the Center for a week, and got the hang of it by day two. After milking the goats, my day revolved around coffee, writing, making lunch with produce plucked from the garden, writing some more, and then whatever evening activity was planned. This was usually just a communal dinner and chatting until bedtime, but on Tuesday nights they host an open mic night where resident writers and people from town read their writing and give each other feedback. It was wonderful to hear other people's work, and I got some truly invaluable insight on mine that changed the entire structure of my book. Writer and publisher Steve Kettmann runs Wellstone with Sarah Ringler. They were living in Berlin and moved to California after seeing the house and having the kind of "life tapping you on the shoulder" moment that compels you to move countries and start a writers residency. They now have two children, a dog called Sally, goats, chickens and a steady stream of writers in their lives. Steve gives amazing writing feedback, and Sarah runs wonderful yoga classes on Saturdays. And now I'm home I really, really miss Sarah's amazing bread. I was in residence with Karen Smyte and Ann Hillesland. Just a few days in and I felt like I'd known them for ages. Ann was writing a novel set in California (check out her stuff here) and Karen was writing a novel from the perspective of a women's rowing coach (check out hers here). I can barely think of a topic we didn't cover in our daily chats. They gave great feedback and I already miss our evenings drinking red wine under the stars. Dinners are communal and a great way to get out of your head after a day's writing. Over the course of a week, everyone takes it in turns to cook. For breakfast and lunches you're on your own, and there are regular trips to town to pick up groceries at Trader Joe's or Safeway. However, the garden is incredibly fruitful – I loved the cherry tomatoes, kale and herbs – and the chickens lay eggs and the goats produce buckets of milk. A pot of coffee is always brewing in the morning, and we wandered in and out of the kitchen taking slices of Sarah's wonderful fresh bread. Writing is hungry work. When you read about writing residencies, the main thing that comes across is "GUYS, I GOT SO MUCH WORK DONE!" I was slightly nervous, especially in my first few days of jetlagged idiocy, that I wouldn't live up to it. But guys, I got so much work done. I'm talking around 40 pages. And they're good. When I arrived, the book I'm working on - a non-fiction book about death festivals around the world - was a mass of notes and chapters that needed ripping apart and research and research and research. Now I have the first few chapters under my belt. This residency was totally transformative. But what are you going to do, work the ENTIRE TIME? With the freakin' REDWOODS DOWN THE ROAD? Hell no. I'd left the center exactly three times in almost two weeks (twice to get groceries, once to go to Mill Valley to interview a transhumanist who plans to eradicate death) when Karen invited me to go hiking with her in the Redwoods. It's surprisingly tempting to stay in the creative bubble that is the Wellstone Center, and even more surprising what a shock it is to be back in a city. I'm glad I had the stepping-stone of a hike in the woods and a few fun-filled hours talking and thinking about something other than my book to ease me back into the outside world. If I've made it sound amazing, incredible, wonderful, awesome, enter hyperbolic adjective here, it was. But instead of sending me good-natured hate mail like my friends, just apply. Wellstone runs residencies for writers and journalists, and also emerging writer residencies if you're still starting out. If you're a writer at any stage, you can apply for a residency at Wellstone and I strongly encourage you to do so. Steve and Sarah have created something very special here.